From Kyushu to the World. Hita Tenryou Sui’s homeland, Hita City is located in the central region of northern Kyushu and said to be a little Kyoto, and at the end of the Tokugawa Period, as the direct shogun demesne, the city played a central role in politics, economics, and culture. In Mameda-machi, where you can especially feel the remnants of such time and feel the vibrancy of the town amidst the emotionality, there are many tourists that come throughout the year. At the center of it all, at the end of the Edo Period, Hita’s Confucuisist Hirose Tansou opened a school, which was at that time Japan’s largest private school, “Kangien.” In addition, Kangien was registered as a Japanese Heritage Site in June of 2015. And this is a town where looking around, one can see water flowing everywhere, along the streets, and the water is blessed and pure, the pride of the town since long ago. We began the sale of Hita Tenryou Sui, born in the town of Hita, which is rich with nature, so that as many people as possible can use it for their health or for their dietary habits. The Hita basin is surrounded by mountains over a thousand meters tall including Kuju, Yabakei Gorge and the active volcano, Mt. Aso which represent Kyushu. That is where "Hita Tenryou Sui" comes from. For a long time, Hita has been called “Suikyou” because it has been blessed with pure, delicious water. 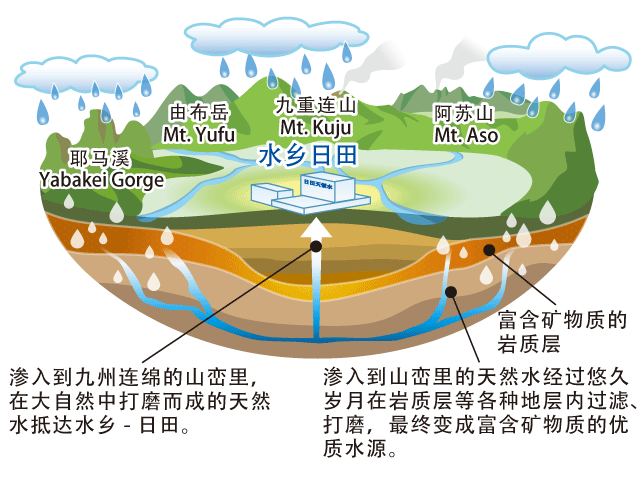 The water that falls into the Hita basin from the mountains goes through complex and diverse filtration through strata and arrives at “Suikyou” or Hita’s land. Even from those waters, Hita Tenryou Sui is taken only from select locations. Beauty and health are universal. Have a healthy day every day with clean spring water! Since the nuclear accident that was triggered by the Great East Japan Earthquake, our consciousness regarding health has changed drastically. In order to maintain health, it is not only important to pay attention to our nutritional intake, but we also must make sure that what we consume is not contaminated by radioactivity. Among other things, a lot of water intake is necessary to sustain life, so extra attention must be paid to it. Because of this situation, “Hita Tenryou Sui” has had many inquiries in regards to its safety. Hita Tenryou Sui and its spring water samples have been filtered through natural filtration systems through various strata deep underground in the Hita basin of Oita Prefecture. Because the water is pumped up from deep, deep underground, the conditions of the surface of the land do not extend its influence onto the purity of Hita Tenryou Sui, so regardless of the circumstances above ground, the purity of the water will not be affected. Moreover, the Hita Tenryou Sui that we drink now has been underground since ancient times—for longer than we can imagine—and what is currently being pumped up is, according to a survey by research institutes in the United States, about 3,600 years old, give or take forty years. Simply with these results alone, one can surmise that current contamination on the surface has no effect on Hita Tenryou Sui. Diving through the series of mountains in Kyushu, the water arrives in Suikyou Hita’s lands after being filtered in nature. Soaking in the mountains for a long time and being filtered through the rocky beds and various strata and polished, the water contains minerals and has a good quality. Even without any real sterilization treatment, the untreated spring water maintains a mineral balance that is approximately 32 mg/l and can pass the Waterworks Act Article 20 in addition to being easy to drink with a slight alkalinity. This water that is easy to drink feels good on the lips and is not difficult to incorporate into one’s lifestyle. Water carries oxygen and nutrients to cells and plays an important role in life such as eliminating waste. Focusing on that quality, the health of everyone is connected to taking care of their bodies. Believing this, we are providing daily water. On one hand, if we bring our attention to water quality, we will be surprised its homeostasis. In the case of Hita Tenryou Sui, over the past ten years, water quality inspection results have changed little. From these results, it has recently become possible to be confident in providing this water for long-time storage in case of earthquake or other emergencies. 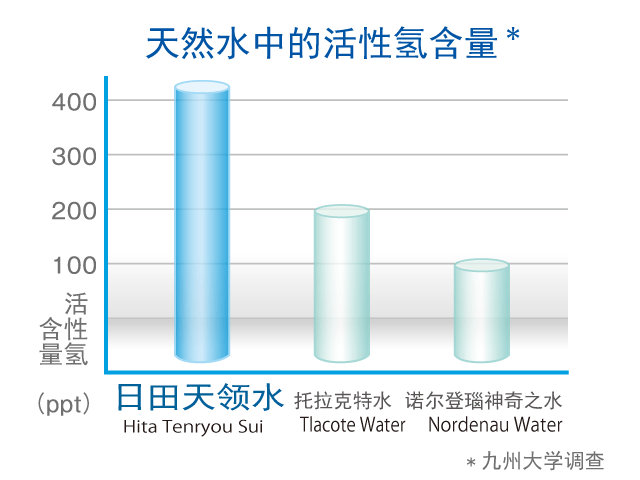 Hita Tenryou Sui is called “natural active hydrogen water” quite often in particular. When this was measured by the "hydrogen radical detection method and quantitative analysis method,” which was a measure invented by a specialist, the measurement gave “Hita Tenryou Sui” a high value in hydrogen radicals such that it was called a water mark in the world and stood next to Germany’s “Nordenau Water,” Mexico’s “Tlacote Water,” etc. with its high rarity value and natural active hydrogen water, and it has many high expectations from people who are hoping for better health. The “hydrogen radical detection method and quantitative analysis method" is clarified in the published patent publication. Active hydrogen content in natural water, Kyushu University survey. 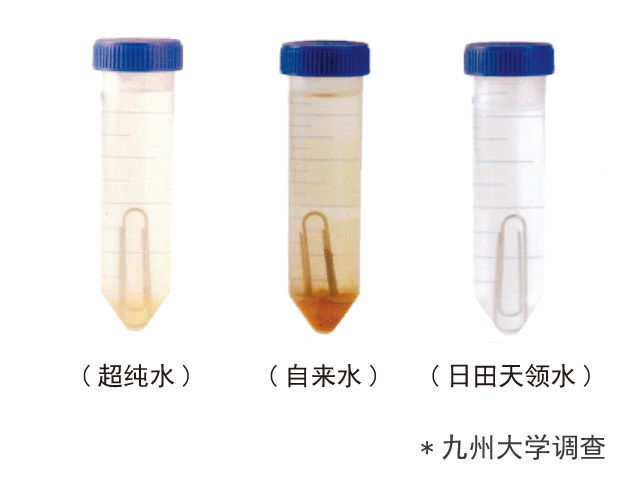 We conducted an experiment by dropping a metallic clip into a container of Hita Tenryou Sui.After nine months, rust had not appeared in the Hita Tenryou Sui (results in picture below).Rust generation experiment by water difference: Ultrapure, tap water. For purchase, inquiries and delivery of the product, please inquire to the distributor below. © 2004-2019 Hita Tenryosui Co., Ltd. All Rights Reserved.